It’s a common misconception that you shouldn’t feed spicy food to small children. 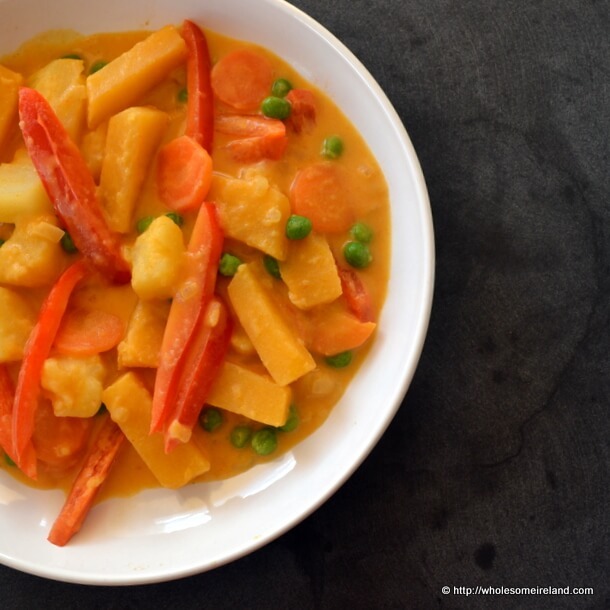 This Thai yellow curry is a huge hit with all the family and is low on capsicum flavour (chilli heat). Most Saturdays involve a visit to the local butcher to pick up my meat for the week, library for the children (and me) to stock up on reading material and the supermarket to get milk. We walk up and down, it’s not that far but it takes us a while. Going for a walk involves standing on the metal grille which sits over an underground aquaduct for a river going to the sea. If it’s been raining you can hear the water coursing underneath which is incredibly exciting when you’re 4. Then there is our secret spot which hides a small amount of wild garlic(ramsons) that we have to check. They’re not quite ready yet and it takes a lot of will power from the 4 year old to leave it alone and wait for a little while longer. The traffic light game has to be played in both English and Gaelic. I spend much of this game apologising to the people walking behind me as I stop the buggy suddenly at a roar of “red” or “dearg”. Rules are rules you see. By the time we made it to the supermarket yesterday I was tired and hungry, neither are a good combination for shopping but I figured I could just about escape any impulse buys so long as I went straight for the fridge and back out in quick smart time. There was a tasting stand at the end of the vegetable section. Normally I’d bypass these kind of displays but the smell wafting from the crockpot on the stand was intoxicating. I had to go and take a look. That was it, I was suckered into trying a deliciously fragrant Organic Thai Yellow Curry from the Thai Gold company, who are actually Irish. At no point was I strong-armed to buy any of their products but I couldn’t but pick up some coconut milk and yellow curry paste. I would often make my own Thai food at home and as a matter of fact have been buying this firm’s rice and rice noodles for a good while. I do make my own pastes etc but this was a real treat. It was then, when I read through their ingredients that I realised that there was no fish sauce in the curry paste which makes this curry paste vegan. The children (aged 16 months to 13 years) and hubby have loved this recipe so much I had to go back down to the same shop this morning and buy more coconut milk so that I can make some more for their tea. You can if you wish add meat to the curry, so watch the recipe below for my notes. This recipe serves our family of 5 with a small amount of leftovers. There is no need to serve with rice so it’s all cooked in the one pot. Once cooled to room temperature, this Thai Yellow Curry will keep for up to 1 month in the freezer. Note: This is not a sponsored blogpost. I paid for all the ingredients from my own pocket. I just love seeing great quality food at a reasonable price. Leave the pot simmering for 5 minutes. Add the carrots, potato and turnip. Stir well to make sure they are coated in the sauce then turn down the heat and cover the pot, top up the sauce with the hot stock so that all the vegetables are covered. Leave the pot to slowly bubble away for 40 minutes. After which time, stir in the frozen peas and red pepper. Simmer for a final 4 minutes then serve. ***If you would like to add meat to your curry, add slices of chicken breast or stewing beef at this stage.